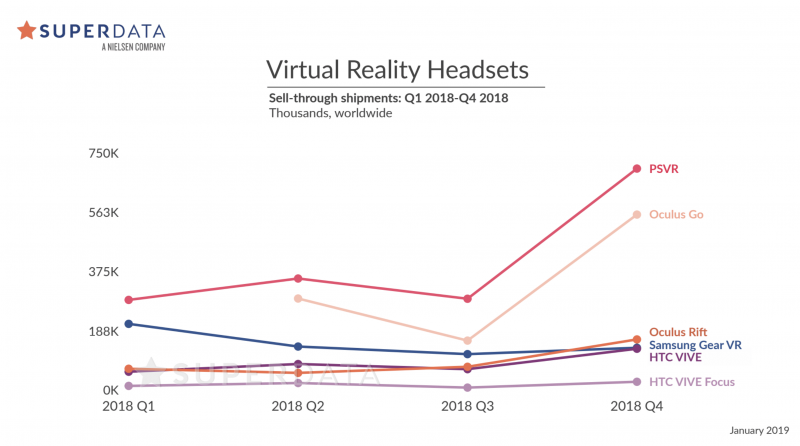 Facebook-owned Oculus’ forthcoming all-in-one VR headset, the Oculus Quest, will sell 1.3 million units this year according to projections by SuperData, a Nielsen company. The research firm noted “high consumer interest” in the device, which was unveiled at the Oculus Connect 5 (OC5) conference in September and is due to launch in spring 2019, priced at US$399. According to SuperData’s stats from last year, Oculus’ US$199-priced Oculus Go headset sold 1 million units since its launch in May 2018. However, PlayStation VR was the top-selling headset during the holiday season, thanks to Black Friday discounts and the addition of acclaimed titles like Beat Saber. 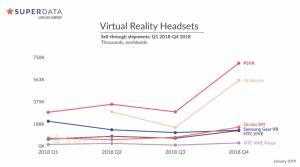 In Q4 2018 some 700,000 PlayStation VR headsets sold, followed by 555,000 Oculus Go units, 160,000 Oculus Rifts and 130,000 HTC Vives, according to the research report. “2019 is poised to be an important year for VR with the introduction of the Oculus Quest,” said Stephanie Llamas, head of VR/AR at SuperData. SuperData estimates that total extended reality (XR) revenue – from virtual, augmented and mixed reality headsets and software – will reach US$11.5 billion in 2022, up 442% from US$6.6 billion in 2018. SuperData calculates figures using information from data sharing partnerships, consumer studies, web and search analytics, publicly announced revenue and sales figures, and information from industry sources.